Whether you’re fitting a whole new bathroom or just replacing your toilet, there’s actually more to think about when choosing the right toilet for your bathroom than you’d expect. You want your toilet to be comfortable, stylish and in keeping with the existing style of your bathroom. But are you looking for a wall hung toilet, a concealed cistern toilet, or something else entirely? Whatever your bathroom’s style, we’re here to help you make the right choice, with toilets from leading brands like Villeroy and Boch. So, where should you start? Fitting a new toilet in an en-suite or cloakroom can be challenging – not only are you limited for space, you often have awkward corners to contend with too. That’s where wall hung toilets come into their own! 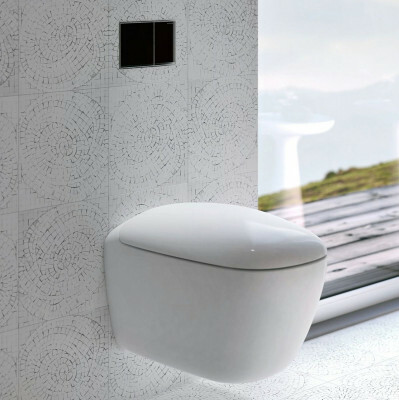 Sleek, space saving contemporary toilets like the Geberit Citterio Wall Hung Toilet take up minimal space and feature a modern design. This rim free toilet is ideal for use where space is at a premium but also updates a tired bathroom. What about if you want a toilet for your en-suite but are looking for a more traditional style? Villeroy and Boch’s Hommage collection includes a back to wall toilet that will add character to traditional bathrooms while ensuring you still have plenty of space. If you don’t have space for a bidet – or don’t want to add one to your existing bathroom, why not consider replacing your toilet with a shower toilet? These are the latest trend, providing a thorough clean without the need for a separate bidet. Many of these toilets feature adjustable spray settings, so you can adapt the pressure to suit, as well as a warm air dryer – some even have a remote control! We love the AquaClean Mera Classic Shower Toilet from Geberit, which is at home in both traditional and more modern bathrooms. One of our favourite styles of toilet to modernise any bathroom has to be a toilet with a concealed cistern. Perfect if you’re going for a clean, contemporary style, the cistern is hidden in the wall, giving your bathroom a sleek, minimalistic look. Villeroy and Boch offer a great range of concealed cistern glass flush plates that will update your bathroom. The ViConnect L200 even comes with LED lighting, in a black gloss finish that’s super stylish and compatible with their Viconnect toilet frames. For those who are counting their pennies carefully, you can't go wrong with a toilet from Abacus. Manufactured in some of the world’s best ceramics factories, the attention to detail is evident in these simple yet stylish toilets. Our top pick for those on a budget is the D-Style Wall Hung Toilet, which is scratch resistant and comes with a soft close seat. Which toilet is your favourite from our selection? If you can’t decide or just need some more advice on choosing the right toilet for your bathroom, don’t hesitate to contact our friendly advisors at Bathrooms Direct Yorkshire. You can talk to us via our website live chat, or by contacting us via our contact page.